LANDOVER, Md. (AP) Ezekiel Elliott and the Dallas Cowboys should soon find out if the running back will be eligible to play the rest of the season. Elliott has another hearing Monday to decide whether he’ll serve a six-game suspension as a result of a yearlong NFL investigation that found he had multiple physical confrontations in 2016 with his girlfriend at the time. NFL Commissioner Roger Goodell suspended Elliott in August for six games, a ban that has been fought over in court since. Prosecutors in Ohio declined to pursue a criminal case, citing conflicting evidence. 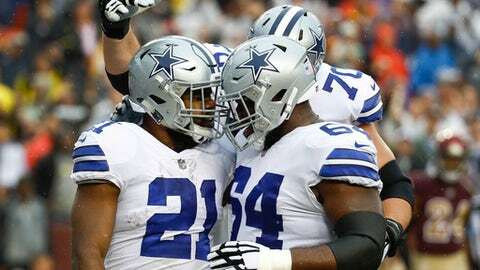 With the 5-2 Kansas City Chiefs up next, the Cowboys hope they’ll have Elliott, who has run for 100-plus yards in three consecutive games and has four rushing touchdowns over the past two weeks. Elliott believes he’ll keep playing. Elliott has 690 yards rushing and six touchdowns and 210 yards receiving with two scores this season. Although the 22-year-old voiced confidence in fellow running backs Alfred Morris, Darren McFadden and Rod Smith, Dallas doesn’t have someone else who can do what Elliott does at his level. Because of that, the Cowboys are eager for some clarity that is expected to come out of Elliott’s hearing Monday. Pro Football Writer Howard Fendrich contributed.